The Technocracy of Argaea (commonly known as Argaea) is a small technocracy on an island in the south of the Audonian Ocean. The nation is lead by a team of engineers of which are lead by the Omega and Prime Engineer. Argaea is funded by Burgundie as a research expedition but exists as a separate nation. Due to the ties with Burgundie, Argaea also has many ties with Burgundie as a culture, such as religious and economic aspects taking foundation in Argaea, despite not being officially enforced. The nation's research and technological expeditions are also sponsored by Heku and Quicksilver Industries, sometimes considered to be a derivative of Quicksilver Industries. Due to the nation's technological and engineering basis, the nation is the sole technocracy of Greater Ixnay. The nation is not lead by people who are elected but instead by those chosen by Burgundie and Quicksilver Industries due to their involvement with the infrastructure of Argaea, as well as their technical ability to manage the nation. The head of these engineers is the Omega Engineer who is known only by Ryan. The second lead engineer is called the Prime Engineer, who is known as Dave. The nation has no official religion, which means that religions from Heku, Burgundie, and other nations can be practiced as long as no laws are broken. The concept of a technocracy was proposed by a Hekuvian member of the Oligarchia grammaticorum (OG) in 2003. The OG was looking to embrace new technologies like artificial intelligence and cyber technology. The thought of an independent nation tasked specifically with furthering science, engineering and other technologies was too much to resist. Members of the OG unanimously approved the proposal and then set about debating the best location for the new nation. The aging, single and childless Baronet of Antarktis Burgund, Mylan Wesserson, was approached by the Burgundian royal government and asked if, upon his death, he allow the baronetcy of Antarktis Burgund to pass out of his hereditary line, out of the Burgundian realm and into the hands of a new independent technocracy. After months of negotiation, Baronet Wesserson accepted a sizable pension, an apartment in Kongerhus and relinquished his hereditary claim to the baronetcy of Antarktis Burgund. He was still allowed to carry to title in the Burgundian court. Burgundie immediately sent an expedition of engineers and survivalists out to create a nation on an antarctic island. The first city, New Haven, was finalized in the year 2011. Argaea is a nation on a single island above the Antarctic continent. The nation is shaped mostly spherical, with New Haven - the single metropolis - lying on a section pushed inward, where ports are constructed. The nation itself has mountains surrounding the outside of the island, with a large field of heated geysers providing warmth to the lush green environment. To the southwest side of the island lies an unnaturally straight area with no mountains, where the ports of New Haven lie. Coral reefs lie around the island and are often visited by scientists seeking a short, local vacation. To the north of the island lies a large forest, and to the east some plains. 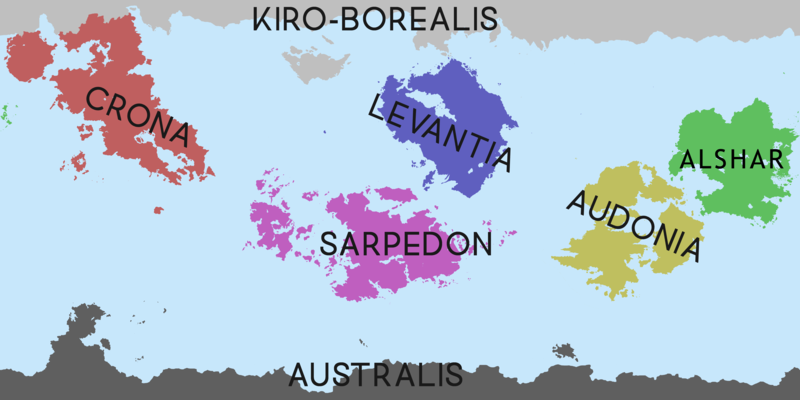 The land itself is flat excluding the mountains bordering the island and Lake Oraggenmar, lying atop a hill flowing into the ocean, slightly to the south of New Haven. Argaea, as of 2027, only has one major city - New Haven. The city is large enough to be considered a metropolis, with smaller subdivisions. The outerlying areas to the north of New Haven are reserved for farming and ranching, while the more southern parts are reserved for the construction of ports and docks. New Haven itself is divided into subregions, which are then divided into three major districts: residential, commercial, and industrial. Some subregions might not have industrial districts but instead have a transportation route to a much larger industrial district; however, every citizen who lives in a residential district should not have to travel for long to reach a commercial district. New Haven uses an extensive monorail system for short distance travel, as well as a subway system for long distance (such as across the metropolis). Cars can also be used but the roads are less populated. The sidewalks are often packed, to the point where sometimes the sidewalks are as wide as the streets themselves. Argaea as a nation doesn't have a national military; however, there is the Argaean Private Armed Forces (which, despite the name, includes an aviation district). The Armed Forces has approximately 500 soldiers, most of which act as private security guards for high-priority Argaean research projects. The Armed Forces also has three mobile anti-aircraft (AA) guns, as well as four armored and weaponized trucks used primarily for transportation but can also be used in combat. There's also an Air Force base to the north of New Haven, with numerous helicopters and planes. The planes are not often used due to Argaea's remote location. In the year 2016, Argaea released it's first finished project in the form of an international time database. The project helped synchronize time across all the nations in a stanadardized format and help synchronize all calendars that use the Argaean format. The calendar format was announced to Heku and Burgundie as the first finished project, and is now accepted by many nations as an acceptable standardized time format. As of 2021, Argaea is working on a central database to store information over all countries in a unified format. The project is still ongoing as of 2027 but is expected to be finished within the next decade. The Argaea Global Seed Vault is a secure seed bank on the Burgundian island of Argaea in the remote Arctic. The technocracy’s directorate started the vault to preserve a wide variety of plant seeds that are duplicate samples, or "spare" copies, of seeds held in gene banks worldwide. The seed vault is an attempt to ensure against the loss of seeds in other genebanks during large-scale regional or global crises. The seed vault is managed under terms spelled out in a tripartite agreement between the Burgundian government, the Argaean Technocracy, and Government of Caphiria. This page was last edited on 20 June 2018, at 17:32.